It’s another fun unboxing video from Geek Fuel. Geek Fuel is a monthly mystery box filled with geeky goodness. 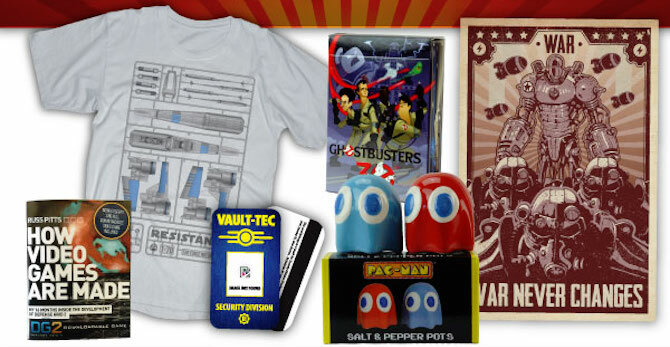 Each month you get a mix of toys, digital games, limited edition collectibles along with a limited edition geeky t-shirt. Geek Fuel sent us their November box, and we unboxed it in last week’s episode of the Nerdcast. The contents of November’s Geek Fuel mystery box was filled to the top with some great items, including Star Wars, Pac-Man, and Fallout themed items. Like all Geek Fuel boxes, this box includes the in house magazine that features information regarding some of the more relevant geek happenings this month. Under the magazine, there was a large amount of goodies to be found. The box included a cool excerpt of How Video Games are Made including the gaming download code found every month in Geek Fuel. To celebrate Fallout 4, this month’s box included both a Vault-Tec security badge and a cool mini poster. For the geeks that have a kitchen, a Pac-Man salt and pepper shaker set were also present. And of course, no Geek Fuel box is complete without a t-shirt, this one Star Wars themed. Overall, we’ve received a number of Geek Fuel boxes to date and we still have not been disappointed. For less than $25 a month you can get a great box delivered to your door each month.